We're retiring the Product Blog. Please follow us on Twitter for the latest news. We're always looking for better ways to communicate with our customers. The Product Blog hasn't been the best format to do that lately. Case studies/stories often get lost in the stream of product announcements. Stories published last year are as relevant as they are today, yet are difficult to find in the blog format. There are 3 disparate places to get 37signals news: the Product Blog, Signal Vs. Noise (our company blog), and our Twitter feed. The Product Blog has only 10,000 subscribers versus the 50,000+ that follow us on Twitter and the 100,000+ on our company blog. It doesn't make sense for us to maintain 3 different news sources. We're looking to simplify. That means retiring the Product Blog. We also hope to explore a better format for this information down the road. Please follow us on Twitter in the meantime to get the latest information on new features, product news, and more. Thanks for your continued support. OmniList is a third-party app that lets you work with your Backpack Pages, Lists, Notes, and Dividers. The app costs $1.99 in the iTunes App Store. Outstanding Occasions, an event planning company, recently posted about how to use Basecamp for a wedding business. 1. Client Login: You can create a new project for each client and assign them a login so that you can give them tasks, share timelines and important documents they need to complete or allow them to collaborate on the wedding design. This might work really well for your business and your clients. We actually do NOT use Basecamp in this way for our wedding clients. We DO use this model for our mentorship clients. There are several planners that use this model of Basecamp and actually include the login page on their website. 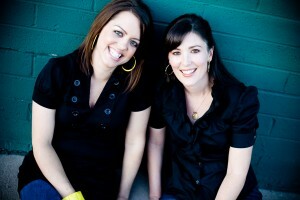 Cynthia Martyn Events and Andria Lewis Events are two wedding planners that do this. 2. Internal Company Use: Another way to use Basecamp is internally for your company (which is nice if you have more than a team of 1.) This is how we use Basecamp for our wedding planning side of our company. It acts as our complete virtual office for Outstanding Occasions. We have a Main Office (which includes our document templates for our company and wedding pro packages and pricing), Mentorship file (where we keep all of our internal documents for the mentorship program), Business Book Library (where the Outstanding team members share their business book reviews of the business books that we all have read), Owners File (where we keep internal documents for Jennifer and I only), and then we create a new project for each new client that we get (but again, we use it internally only and do not share it with our clients.) As stated above, we also have a separate project set-up for each mentorship clients. The mentees are the only clients that we share files with. In the second part (Basecamp for Wedding Business, Part 2), Outstanding Occasions walks through the actual Basecamp process it uses for wedding planning. Outstanding Occasions is co-owned by Heather Crabtree (left) and Jennifer Thinnes (right). Getting Real is now available for the Kindle. Price: $19. The book details how to build a web app and explains the business, design, programming, and marketing philosophies of 37signals. It is a precursor to our latest book REWORK. For non-Kindle folks, you can also download Getting Real as a PDF, buy a paperback copy, or read it online. Since launching Basecamp in February of 2004, Basecamp has had a feature called Milestones. Milestones were used to keep track of major dates in a project (phases, launches, deliverables, etc). Over the years our customers have been asking for a proper calendar to replace the basic list of milestones. They liked the milestones functionality, but they wanted to be able to add and view their milestones in a traditional calendar layout. Further, they wanted to add items to the calendar that weren't major project milestones. Things like meetings, appointments, lunches, someone's out on vacation, phone calls, etc. We've been listening. Over the past few months we've been hard at work building out this top customer request. Today we're proud to release the brand new Basecamp calendar. The "Milestones" has been replaced with the "Calendar" tab in your projects and on the Dashboard. When you add something to the calendar you'll see two options: You can make the item an event or you can make it a milestone. A milestone has a checkbox and is marked late if the date passes without the checkbox being checked off. Same as before. Events don't have checkboxes and aren't marked late. An event might be "9am Team breakfast" while a milestone might be "Client review and signoff" or "Launch". You can use events or milestones any way you'd like, of course. You can also set up spanned events. Spanned events let you designate events that last more than one day. 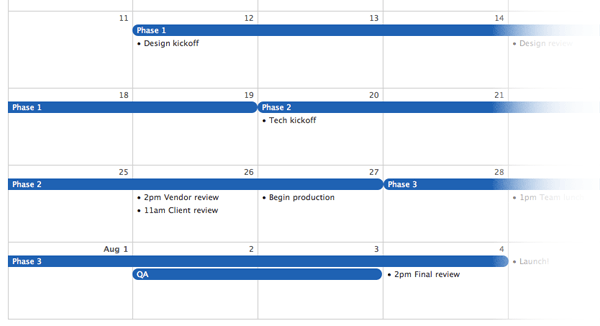 You can even use spanned events to label project phases. The 14-day view on the Dashboard and Overview screens have been updated as well. 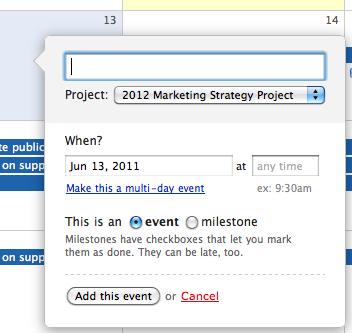 And here's a real bonus: You can now add events or milestones to any project on the calendar on the Dashboard. When you add an event or milestone from the global Dashboard calendar, you'll see a pulldown that lets you select the appropriate project. Now you don't have to go into a project to add an item to that project's calendar. It's live in your account right now! This feature came directly from customer requests and feedback. Thanks for your patience while we developed the new calendar feature. We hope you love it as much as we do. As always, thanks for using Basecamp! 37,000ft is a third-party tool that shows you every milestone, todo, task and reminder on a single page. I’ve long wanted to see, on a single page, all the tasks required of me across the multiple Basecamp accounts and projects that I’m a part of. I’m thrilled to announce that now, any user of the 37signals products can do just this. And for good measure, you can see all your Highrise tasks and Backpack reminders on this page as well. There's a full explanation of why the SignalKit team decided to build the tool at Introducing 37,000ft. You can now view all of 37signals' open source contributions on a single page. Canister is a third-party Mac app that allows you to easily download your Basecamp files to your computer. It's priced at $9.99. Whether you are looking to keep an archived backup or need a way to easily interact with your files, Canister can help. Utilize the power of Mac and Finder to easily interact with all your Basecamp files. With multiple-account support, you will be able to download all of your files, no matter how many accounts you work with. Switch Video is an animation company that makes videos that “explain what you do.” At the company blog, Andrew Angus explains how Basecamp helps Switch keep its promises. 1) We will set reasonable timelines and meet them. We won’t promise what we can’t deliver. Basecamp Task Manager lets us add tasks, assign them to individual team members, and set deadlines. This helps us lay out the project from start to finish to make sure each project plan is realistic and achievable. 2) We will keep you informed. It is important to know where things stand, so we will keep you up to date. In Basecamp, we can send general project-related messages to clients or team members anytime, and they’ll all be together in one place. Instead of replying with a new message (as you would in email), you post a comment to the original message, which keeps everything neatly together in one stream. Or we can even send comments right from the task list as we’re working through the project. 3) We will complete all aspects of the job. You won’t have to ask twice. With Basecamp, we don’t lose track of any tasks because we can set up project milestones to see at a quick glance which tasks are coming up – in both calendar and list view. 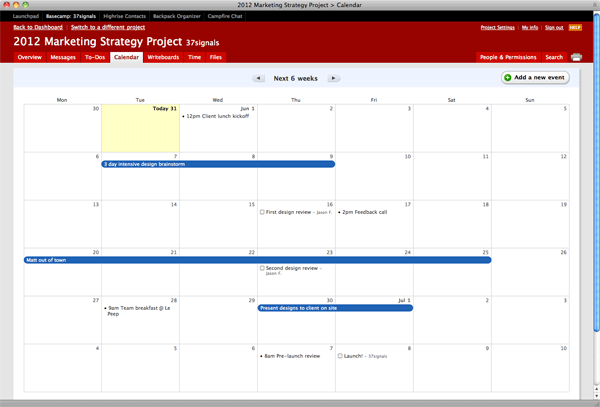 Individual team members can even download calendar items into our individual calendars – cool stuff! With Basecamp on our side, we’ve proven time and again that it IS possible to deliver brilliant creative work and still be on track, on time and efficient. In "Being Bullish on Android Doesn't Mean Being Bearish on Apple," Tim Beyers looks at what works and what doesn't on the new Samsung Galaxy. Meebo, my cloud-based IM client, suffers some hiccups, but Evernote works great. So does Highrise, a cloud-based contact-management system from 37signals that I've come to love. Read the full piece at Motley Fool. All-Done is a third-party iPhone app that brings Ta-Da List to your iPhone. You can use it to sync your lists with tadalist.com, add lists and items, and move/copy items from one list to another. I have been a fan of TaDa List for quite awhile. However, I have found that the iPhone web app, while very functional, was still a web app. Wanting to further my iOS development skills, I undertook the task of creating a native iPhone/iPad application that interfaces with Ta-da Lists. After several months and a fair amount of Fiddler and HTTP Client usage, it's ready. Autosave for Basecamp is a Google Chrome plugin created by digital-telepathy that saves your progress when writing posts in Basecamp in case something unexpected happens. How many times have you been writing a comment and clicked on a link in the comment thread to reference something and lost your comment in the process? Loose a message because Chrome crashed for one reason or another? Accidentally hit the refresh button? The Autosave for Basecamp plugin will automatically save your message in real time as your typing it using Chrome's HTML5 local storage technology. Hit the refresh page, write a message and come back to it later, close the browser - your message will still be there! Aging Wisely was founded in 1998 by Florida Elder Law Attorney Linda Chamberlain. She saw the varied needs of elders and their families and formed Aging Wisely so families would have help navigating care options. In 2005, she formed EasyLiving, Inc., a private duty home health care company serving individuals and families in Pinellas County, Florida with home care, companionship and senior transportation. Below, she explains how her companies use Backpack. Our companies serve seniors in their homes and therefore have a very mobile work force. The families of our customers are all over the country and world. Employees are rarely in an office setting and communication and coordination are vital. 37signals tools have helped improve communication and efficiency. Because the products are so intuitive, employees didn’t experience the frustrations and learning curve that they did with other solutions we had tried. Both companies use Backpack extensively, which has replaced accessing a server for documents or long strings of emails that become cumbersome. Our team can access the documents they need, share notes and information from virtually anywhere with web access. Aging Wisely’s care managers use iphones, so they can pull up information just about anywhere. EasyLiving benefits from the shared calendar for managing time off, on-call schedules and trainings. With 24/7 services, client emergencies and communicating office happenings to a large number of fields staff, this is vital. Our care management team at Aging Wisely is comprised of experts in the field of eldercare, with diverse specializations. We serve as resources for our clients and need to be up to date on everything from new healthcare requirements to latest Alzheimer’s research and what products can help our clients age in place. To do this well, we need to be able to share articles, training information, links, etc. We have different pages on Backpack for different topics, making it easy not only to share the information but to access it any time. Our team is known for its expertise in the community and gets asked to do presentations for a variety of groups. We often do these speaking engagements together or work on the presentations and materials together. Our Director of Communications works remotely, but can collaborate from anywhere with ease using these tools. When we plan a presentation, team members will post ideas and work on input to the Power Point and/or handouts using Backpack. My tip for other customers: For teams who aren’t used to using collaborative tools it can be a challenge to switch the mindset and get less email-dependent. Over time, though, people will see the benefits and develop new habits. Do a little demo for everyone and explain how the tools will make life easier. One of the great things about these tools is that they are pretty intuitive, so you don’t need any major training and the learning curve is minimal, but it helps to explain what the purpose and benefits are. A customer asks: "Can I add a Basecamp login box to my own website?" Answer: Yes. Plug this code into your HTML (note the customizing required). "What would we do without Highrise?" asks Tracy S Schmidt in this tweet. Schmidt is Lead Trainer at 435 Digital, a consulting firm that helps businesses with SEO, social media, web design & training seminars. She teaches classes for both public & private organizations and uses Highrise to keep track of class registrations. I run a new training program at Tribune focused on social media and SEO. Our attendees are readers of the paper, where we advertise our classes mainly, and Tribune advertising clients. I need to keep track of the emails I get from all over, with questions about dates and prices and the like. We use clunky Outlook and it's hard to keep track of who asked for what. Plus I want to know who should get emails about particular upcoming classes. So I've been using Highrise since the training program launched, which was March 1. We are now rolling it out nationally and partnering with a local university. What's more, a lot of attendees have the potential to become clients or subscribers to different Tribune brands. Highrise has been great for helping me stay organized and now, as we grow our staff, my colleagues as well. Are you a Basecamp customer who also owns a BlackBerry? Unvired is looking for beta testers for a new app that brings Basecamp to your BlackBerry. If you'd like to help them test it out, send an email to support [at] unvired [dot] com along with the type of BlackBerry device you own. Update: Unvired says, "We have received lot of requests and are not accepting any more requests for now." You can still email them to receive an announcement when the app launches though. A list of tips to help you be more productive in Highrise. In your contacts tab, you’ll see an option to change the view of your contacts list at the top of the screen. 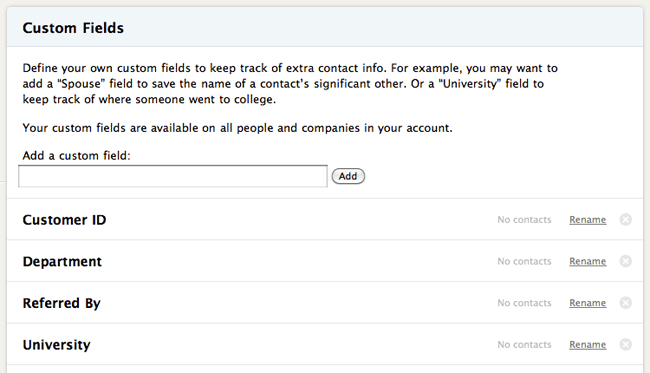 You can filter your contacts by name, title, email, city, state, country, zip, phone, or background. Or you can create custom fields now too. More details. How Erskine Design uses Basecamp's To-Do lists to create "The Project Backlog"
Let's flashback to an '09 post by Erskine Design's Jamie Pittock: Project management is easy. In it, he offers some good tips for getting the most out of Basecamp To-Do lists. The obvious answer to avoiding forgetting things is to write them down. Project related things could be tasks, ideas, requirements, feature requests, websites to look at, something a client’s said: anything at all. For all of the above we create a to-do list in Basecamp called the Project Backlog: this is where we write everything down that needs to be remembered and isn’t actionable by a specific person in the near future (more on what to do in that case soon). don’t assign items in this list to anyone; they aren’t actionable yet, so you don’t want them to appear in anyone’s global to-dos yet. The main thing is to get everyone using it and to not be precious about what goes in there. There's also a good section on using lists for weekly reviews. Read the full piece. London web agency: "Highrise Deals are great for building up a picture of cash flow for the coming months"
Cyber-Duck is a digital agency based in London that specializes in user-experience, SaaS projects, and online marketing. Tom Hicks, Cyber-Duck's Online Marketing Manager, explains how the company uses Highrise below. A CRM became a business requirement for Cyber-Duck in 2009 after Excel contact databases became messy and over-complicated. New members of the team found them difficult to decipher after years of new columns and redundant colour coding, and with the volume of enquiries we were receiving and proposals we were sending out it became difficult to keep track of new business. During 2009 we were happily using Basecamp and knew that 37signals had another product which may suit our circumstances, but we wanted to consider all the options available to us. We set about trialling several other CRM systems for small businesses like ours, and found some great options out there, but they all had one thing in common – they were over-complicated. What we needed was something that would give us the required functionality without all the unnecessary extras. There were 2 reasons behind this; firstly, training becomes much easier if a system is simple and indicative; secondly we wanted to ensure we were getting value for money. If a product has features which remain redundant, then you are paying for something you don’t need. From our research, Highrise appeared to be the only solution to tick all of our boxes. It is intuitive and can be picked up with little or no training. We like the fact that we can manage and tag all contacts including staff, suppliers, associates' clients, and potential clients. The ability to browse by multiple tags (our tags shown at right) is especially impressive. The latest ‘activity stream’ allows management to have a quick (and collaborative) overview of the current status of new deals without delving too far into the system. This is important to us because historically, internal communication about new business was difficult due to the large amount of information available and the lack of data centralisation. The ‘deals’ feature also allows a quick overview of projects which have recently been won or lost. This is great for building up a picture of cash flow for the coming months. We’ve also found that the ‘follow up’ feature has been very useful for the sales team, as it gives them a gentle reminder of when will be a good time to follow up leads. Highrise simply works well for us; it has enough features to do what we need it to do, but 37signals don’t feel the need to continuously add more things we would be unlikely to use. It’s also quite cost efficient as pricing scales as the business does. Tip #1 – Exploit tags - Tags may be something you see all over the web, but don’t underestimate their power in the context of a CRM. Make sure you get all users to conform to the same tagging system, this means that when you need to find an expert in SEO or a list of your previous clients, you’ll be able to get them in the click of a button. Tip #2 – Keep deals up to date – The whole point of a CRM is that it’s a centralised repository of information; so it’s important that you keep all your deals as up to date as you can. This means that when someone goes in to find out something about a deal, they will be presented with all they could ever ask for; thus saving time and streamlining both your day and theirs. Tip #3 – Don’t forget the follow ups – Highrise gives you the chance to create simple follow up alerts (Tasks) for any employee. This is particularly great for sales as it allows you to set times to follow up your leads and be reminded exactly when you need to do this. Just like that, forgetting to follow up is no longer a problem! We recently updated the way that permissions work in Basecamp to give you more control over your to-dos. Now you can you decide which people can and cannot check off to-do items. How did the permissions work before? When you are inside of a project, you can see the permission screen by clicking the "People & Permissions" tab and then clicking "Add people, remove people, change permissions." That screen shows you some permission options inside of a green bar for any person that belongs to a different company than your own. When the right-most button is selected, it means the person can do everything. If the middle button is selected, the person can add/edit messages and files as well as to-dos, but not milestones. Finally when the first option, "Messages & Files" is selected, it means the person cannot change to-do items or milestones. But there was a small wrinkle in this system. Even if somebody only had access to change messages and files, they could still check off to-do items. Now, if you restrict somebody's permission to only "Messages & Files", they will no longer be able to check off to-do items. You will have to give people "plus To-dos" access in order to allow them to check off items. By default, anyone you invite has full access (messages and files, to-dos and milestones). It's up to you if you'd like to restrict their permission after they are invited. It's possible on many accounts that people are currently taking advantage of the old system: they were checking off to-do items even though their permission was only set to "Messages & Files." If anyone on your account complains that they can no longer check-off to-dos, you can easily fix the problem by going to the permissions screen and setting their permission to "plus To-dos". We made this change so you can have more control over which people can check-off to-do items and which people can't. The old behavior wasn't completely logical, so we think this is an improvement and we hope it makes more sense to you too. Cruise company: "All projects, meetings and ideas are now discussed in Basecamp"
Steven Macdonald is E-commerce Manager at Hurtigruten, an international cruise/travel company. The company recently decided to cut down on internal email and use Basecamp and Macdonald discusses the result in "Project Management made easy." All projects, meetings and ideas are now discussed in Basecamp and are shared between E-Commerce, IT, Reservations, Marketing and Web. Not only are we able to track projects, it also removes the necessity of reporting as the projects provide an overview of progress. Instead of writing up summaries or completing excel sheets; we are now able to link to the project directly. Basecamp allows us to track all of our projects and is the best communication tool we use at Hurtigruten. After each meeting, our action plan now begins with “Create project in basecamp”. Over the past five months or so I've been working with the Basecamp project management system quite a bit. Maybe you've heard of it? Only about a billion people use it every day. Since using it I've been annoyed and surprised at the fact that there's no native BlackBerry application to manage these projects. So I've taken it upon myself to fill this void. Introducing Peak! You can subscribe to your Highrise iCalendar Task feed to see your tasks on your Backpack Calendar, Apple iCal, Mozilla Calendar or any other program that supports the iCalendar format. This is where you will paste the URL of your Highrise iCalendar feed. To get that URL from Highrise, click the "Subscribe to your tasks in iCalendar format" link at the bottom of the Tasks tab in Highrise (see right). Then copy the link that begins with “webcal://…” — this is the URL you’ll then paste into Google calendars. At humbledMBA, Jason Freedman offers up "lessons learned...and relearned." Recently, he posted "The 6 best startup books to read before starting your company" and Getting Real and REWORK made the cut. Today we can finally answer the question "When will Highrise have custom fields?" Answer: Now and forever! Custom fields have been the top Highrise feature request for some time. The lack of custom fields has also been one of the top reasons why people cancelled Highrise or didn't sign up in the first place. As you can imagine, we're very excited to introduce this feature. We hope you love it as much as we do. Custom fields allow you to keep track of extra information beyond standard contact information (phone, email, address, etc.). 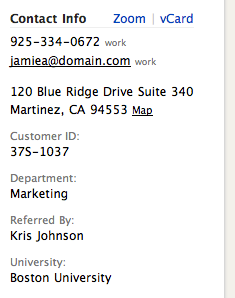 For example, you can add a custom field called "Referred by" to keep track of who referred a customer to you. Or "Spouse's name" so you'll never forget the name of the husband or wife of one of your contacts. Or maybe a field called "University" to keep track of which college someone went to. Or maybe you just want to keep track of a "Customer ID". Custom fields make it all possible. How do I set up, view, and search custom fields? Go to any contact, click the red "Edit this person" link in the upper right corner of the person's page. Next scroll down below the standard contact info fields. You'll then see a block called "Custom fields". This is where the custom fields are listed. Click on the "Set up your custom fields link" to add/change your custom fields. This is where you can create fields, rename fields, or delete fields. Custom fields show up in the sidebar on a contact's page right below their contact info. In this example you'll see four custom fields ("Customer ID", "Department", "Referred by", and "University"). Finally, you can search by any one of your custom fields. Searching custom fields works the same way as searching any other contact data. Click the "Contacts" link in the sidebar on the left side. Next you'll see the usual "filter your contact by" links plus your custom fields as well. Based on all the requests and feedback we've received, we think this feature will make a lot of people happy. We hope you find the feature useful. Thanks for your patience while we developed this Highrise feature. It took a bit longer than we anticipated, but we wanted to make sure we got it right. Software developer calls Basecamp "the single most important piece of project management software"
Don Schenck owns the software development company Xceeda, Inc. In Project Management, he discusses how he collaborated with others on a recent project using Basecamp. Basecamp is, arguably, the single most important piece of project management software ever created. "Wow, Don ... that's quite a statement!" Yeah, well, you use Basecamp and you'll become an evangelist as I am. Basecamp allows all the important parts of a project -- artifacts, messages, schedules, etc. -- to be stored in one place. Any "stakeholder" (BUZZWORD ALERT!) can access the project's information from anywhere: Computer, iPad, phone. Even a Windows-based machine. As you might imagine, the old-school owner of the creating company (NOT me) was opposed to the idea. "We have Microsoft Project" ... "It's in the cloud" ... "We don't have a process in place" ... all the excuses -- and that's all they are -- you would expect. Nixed. Shot down. Kicked to the curb. So, like any good self-starter, I purchased my own subscription to Basecamp and started using it. I invited the client to join my project. They did, immediately, and are already liking it. Today, while working with an ancillary party (the usability experts), they asked me to make the latest copy of the prototype software available to them. "No problem. I have an online project management software that I use ..."
"Yeah! How'd you know? Did Kristy tell you?" "No, I've used it before with _____. It's great." So, despite the best efforts of the owner, we're using Basecamp, collaborating on this project, communicating and sharing "stuff" via one, central location. John Gannon (below) is an Associate at L Capital Partners and he recently offered up "4 tactics that worked for me in my recent job search." One tip: Track your activities and follow up tasks in a systematic way. Gannon recommends using Highrise to get that done. I’m a firm believer that the job hunt is very much like a sales process, where you’re prospecting (finding potential opportunities), conducting a needs assessment (interviewing), following up, and closing (negotiating your compensation package and signing on the dotted line). Any professional salesperson is using a CRM of some sort (even if it’s just a spreadsheet!) to track and plan their activities, and a professional job seeker should be doing the same. See Gannon's other tips for job searching. Michael Wailes, Interactive Developer at Burns Marketing and Communications, examines the 37signals Suite as a project management system in his Geek Chic column at Northern Colorado Business Report. The piece looks at Basecamp ("truly puts collaboration into the project management process"), Highrise ("think of Highrise as Outlook on steroids: a conversation management system"), Backpack ("your company's intranet - a repository of all those things (forms, documents, how-tos, and guides) that are currently scattered across your office"), and Campfire ("looking for a way to have three or more users in a conversation, then Campfire is your answer"). For me, two things are a must when it comes to project/collaboration management software: simplicity and portability. I don't want to spend a tremendous amount of time learning how to use a system, or even worse, learn just the bare essentials and miss the real power and productivity aspects. I also want access in as many places as I can get it - in the office, at home or on the road...If you are looking for an affordable, accessible, well-supported set of tools to help organize your team and projects, then consider giving the 37signals Suite a try. More details on the 37signals Suite.